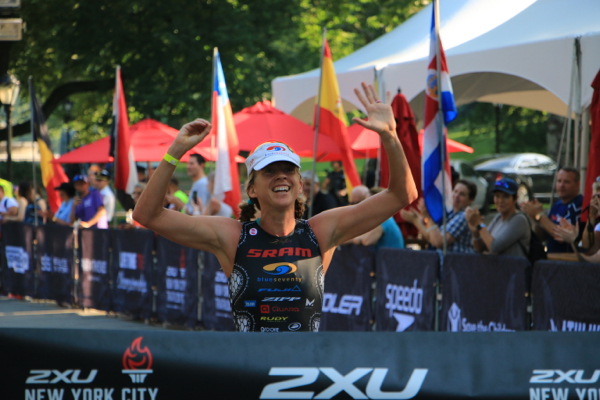 The last time I raced in New York City was 2016 and it was just a few weeks before I became pregnant with my son. It was great to return and I was excited to try and repeat my 2016 victory. New York City is such a fascinating place with so much energy and vibrancy. 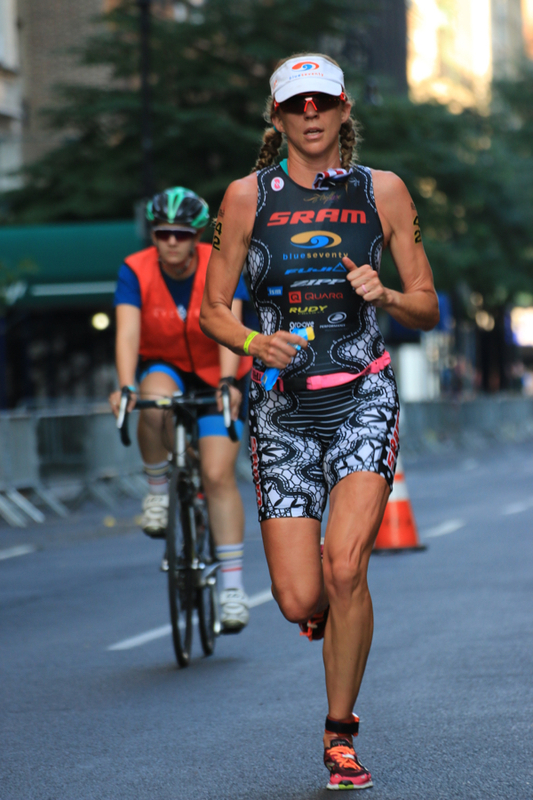 It’s an amazing place to race amongst hundreds of triathletes who come to race in NYC from around the globe. Travel to NYC was pretty easy with a direct 2 hr 30 min flight from St. Louis, although it did take 90 min to travel six miles from the airport to our hotel when we arrived. It will be wise to keep in mind not to arrive into New York at rush hour on Friday afternoon in the future, (if it can be avoided). 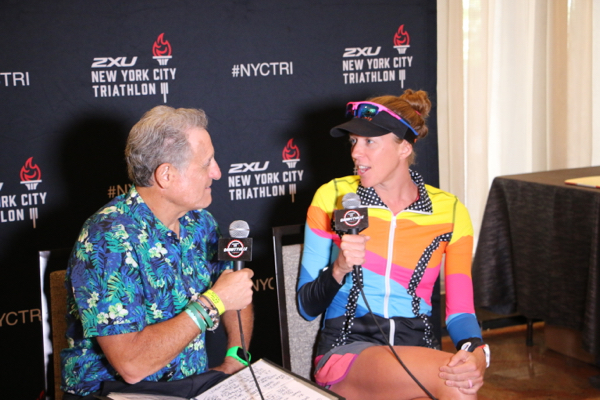 The day before the race was busy with a group run into Central park at 9AM, followed by Breakfest with Bob at 11:30, swim at noon, Pro press conference at 2pm and the race briefing at 4pm. I actually prefer to stay busy the day before the race. I am used to being on the go all day at home, so it’s nice to keep that routine pre-race. With a toddler in the house, I don’t really ever sit down during the day at home, so it would feel strange sitting in my hotel room for much of the afternoon! After the race meeting, we had an early dinner and then I packed for the race and began relaxing by 7pm so that I could try for an early bedtime with a very early start time race morning (5:52AM!!). I went to bed at 9:30, but was woken shortly after at 10pm as Nate was screaming in pain from a leg cramp! Yikes! I would get those while pregnant, but this was the first I have heard of Nate screaming in pain! I managed a few hours of sleep before I woke up to use the bathroom at 2:30AM and then tossed and turned before the alarm went off at 3:30AM. The night before the race, I feel you can’t worry at all about your sleep. With such an early wake-up, you just have to get the body going and then to body knows what to do! I road down to the race course with Nate, Austin and Cameron Dye at 4:20AM. Nate and Cam both had lights on their bikes, so this helped us navigate through the dark, although most of the streets were decently lit and still busy with some light traffic. Normally this time of day would feel slightly cool, but with the concrete of the city retaining heat during the night, it was 85 degrees! After racking my bike, I had just over a mile walk to swim start. I jogged about half of the distance and walked half the distance. With it being so warm, I wanted to minimize sweating pre-race and I didn’t feel like my body needed as much of a warm-up with the heat. I did a few run drills and strides and then got ready to swim! The Hudson was 72 degrees, so it felt amazing swimming, although it was an extremely short swim. I think I had my “fastest” 1500 to date with a 12:16! That current was really going strong when we were swimming. We had a dive start and began a couple of minutes after the pro men. I had a middle start number, so I started as close to the left as I could (that’s where the current was fastest). 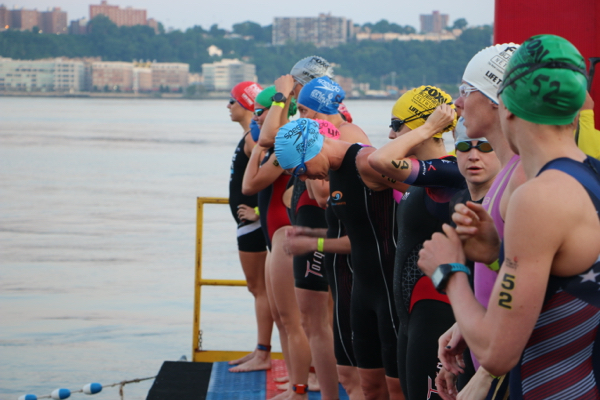 About 300-400 meters into the swim, I took over the lead and exited just before Lauren Goss. 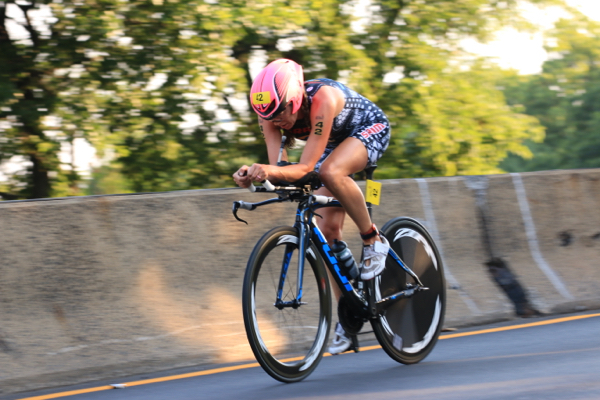 I used my Blueseventy PZ4TX swim skin with the Blueseventy Element Goggels. This next week I am going to take some downtime and have a mini break before I start training for the remainder of my season. Thank you to everyone who gives me such positive support. This race was win #50 in my professional career and can not believe I have reached this milestone in my career. Reflecting on this past month it has been extremely busy and I can’t thank grandma enough for watching my babies while I am working/racing. When it comes to attaining a goal, the only person who needs to believe in that goal is yourself. 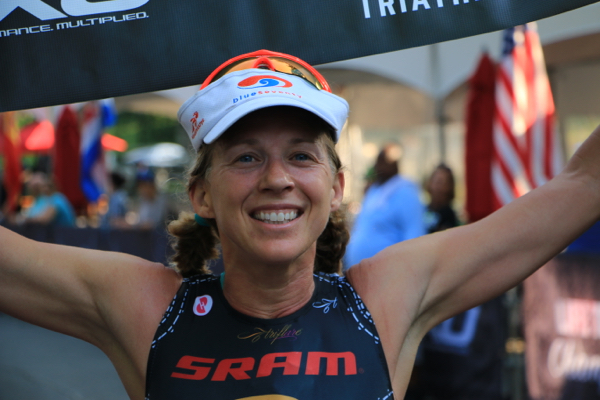 Congrats to the many who finished NYC Triathlon today!